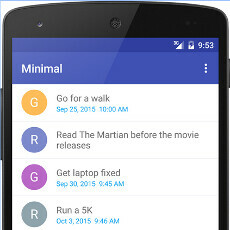 Minimal To Do is a new take on the daily to-do list struggles we all have, aiming to simplify the entry and disposal of tasks without a ton of unnecessary features you would rarely use. Just tap the Plus button, enter a quick task content, slide the Reminder switch, if needed, and you are golden. Dismissing the task as done is as simple as swiping it left or right, and you can undo this action for a short period of time afterwards. The Reminder switch pops up a large and easy to tap on calendar and clock, and the task will display if it has a reminder set afterwards. Minimal To Do has no complicated settings to wander in, just a simple night mode that swaps the color scheme to a dark background, and that's that. The app is done entirely in Google's blocky and colorful Material Design interface concept, and about the only downside of Minimal To Do is the lack of a widget to place on your homescreen, or the lack of syncing with popular task schedulers - now that's too minimalistic for our warped Android tastes, but the developer is a one-man army, so a widget is probably in the cards for a later appearance, too. Give the app a try from the source link below, if its plain and minimalistic ideals had you interested. Finally a simple one....had to use to do reminder till now but it was starting to look a little out dated. I came across this app on Reddit, and gave it a try as soon as I saw the screenshots. The app itself is minimal, but for some weird reason it didn't show any heads up notifications when I set couple of reminders.